Just like law music is almost everywhere. It should be no surprise to find law and justice in songs, and a few years ago I first explored this theme in my post The Legal Song: Legal history in lyrics. This time I want to look a bit closer to a specific genre, broadside ballads, a subgenre of pamphlets, yet another subject not unfamiliar to regular visitors of my blog. Recently the team behind the French legal history project Criminocorpus launched the website Complaintes criminelles en France (1870-1940). Broadside ballads as a musical genre have come into view in particular for the United Kingdom, but this genre existed elsewhere also, and not only during the Early Modern period (1500-1800). The genre definitely widens my perception of pamphlets as a communication medium. Last week I first saw the new French collection. In fact it pushed me to look again at digital collections with only broadside ballads. Even if their number is still restricted, they now exist for more countries than I was aware of, reason enough to have a better look at them. Jean-François Heintzen has created for Criminocorpus a database in which you can search with a simple search with the possibility to use a proximity search. As for now the search interface is only in French, but no doubt an English interface will be added soon, because all elements of Criminocorpus can be accessed in both French and English. You can also search using an interactive map of France which shows you also where most of these complaintes were originally heard. The digital collection with these songs has been created by the Bibliothèque nationale de France for its digital library Gallica. It becomes quickly clear Paris has the largest share, and also the largest audiences, and it seems people in Brittany, around Lyon, in the Languedoc and near the Belgian border could have heard them a bit more often than in other parts of France. The database is strong in indicating the tunes (timbre) to which a complainte was sung. It even alerts to cases in which another song presented the same criminal event. You will find whenever possible also information about the crime and the fate or trial of the accused. I could not find the exact number of complaintes in the database, but a quick look at the interactive map suggest the number must be around three hundred. 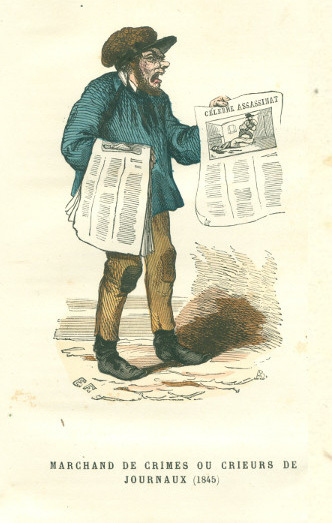 The comment in French under the image of the man with a broadside ballad in his hand connects the songs explicitly with news: Marchand de crimes ou crieurs de journaux, “crime merchant or newspaper crier”. The broadsides featured often a telling image, one of their attractions. Dutch street singers used in the nineteenth century a so-called smartlap, literally a “sorrow cloth”, a large illustrated roll which they could unfold and hang on a pole. The word smartlap is still used as the synonym for tear-jerking melodramatic popular songs. I searched for other collections in France with exclusively complaintes criminelles, but this selection from the holdings of the BnF is the largest one. When you search for complaintes in the website Moteur Collections of the Ministère de la Culture it brings you a substantial number of results in a wide variety of collections. The French portal for digital cultural heritage Patrimoine numérique leads you to just one collection with recordings made between 1979 and 1988 concerning oral memory, chansons and popular dances from Mont-Lozère for which the link was broken. You can get access after authorisation to recordings in the Ganoub database of the Maison Méditerranéene des Sciences de l’Homme (MMSH) in Aix-en-Provence. Straatliederen, “street songs”, form a substantial part of the Dutch Liederenbank created at the Meertens Institute for Dutch Ethnology in Amsterdam. This database contains now a staggering number of 170,000 Dutch and Flemish songs. At the Memory of the Netherlands portal you can access and search for some 7,000 broadside ballads with nearly 15,000 songs, both from the holding of the Meertens Institute and the Dutch Royal Library. You can listen to recordings of some of the most popular songs, too. The founder of the Liederenbank, the late Louis-Peter Grijp (1954-2016), was not only a musicologist, but also a performer of early music and popular songs, playing the lute as a soloist or with his ensemble Camerata Traiectina. His research into the use of contrafacta, songs made to re-used melodies, helped to recognize texts as song texts, and to find the right melody or melodies for performance. For Germany and Austria researchers can go to the project VD Lied: Das Verzeichnis der deutschsprachigen Liedflugschriften. This project builds on the bibliographical project VD16, VD17 and VD18 for Early Modern books from Germany, Switzerland and Austria. VD17 and VD18 link to digitized copies of the works they contain. The partners of VD-Lied are the Staatsbibliothek zu Berlin, the Zentrum für populäre Kultur und Musik in Freiburg am Breisgau, and the Archiv des Österreichisches Liedwerkes in Vienna. This database contains 30,000 songs from 14,000 digitized Flugschriften and Flugblätter. Digital collections in the Anglophone world get perhaps more attention than collections elsewhere in the world, but it makes sense to bring them here together. The English Broadside Ballads Archive (EBBA, University of California at Santa Barbara) has become the portal to access a number of digital collections in the United Kingdom and the United States, with a focus on seventeenth-century ballads. The Pepys Collection of Magdalene College, Cambridge (1,800 items), the Roxburghe Collection of the British Library (1,500 items), Scottish collections at Edinburgh and Glasgow, and three collections of the Huntington Library, San Marino, CA, all in all almost eight thousand ballads, can be searched here together. The bibliography and additional information strengthen its online presence. In the Huntington Digital Library you can search among some 500 digitized ballads. It is well worth including here also the Kenneth S. Goldstein Broadsides (University of Mississippi Libraries) with some 1,500 ballad broadsides from the United Kingdom and Ireland from the late eighteenth to the early twentieth century. At the web site Glasgow Broadsides Ballads Glasgow University Library has digitized some nineteenth-century ballads from its Murray Collections for which earlier ballads are accessible through EBBA. The National Library of Scotland created the collection The Word on the Street with among the 1,800 broadsides from the period 1650-1910 also some ballads. I am sure I might have missed some websites with transcriptions of ballads. Let’s not forget to point you at least to the Broadside Ballad Index created by William Bruce Olson, and the Folksong Index and Broadside Index created by Steve Roud, accessible online at the Vaughan Williams Memorial Library, London. However, in a competition among digital broadside ballads collections Broadside Ballads Online of the Bodleian Libraries, Oxford, still clearly would wins for sheer numbers (30,000 items)! In its new design, light-years away from the austere user interface of Ballads Online which had survived all changes behind the surface, you can even choose the colours of the main type font. A second outstanding thing is the coverage in time, not only the period before 1800, but right into the twentieth century. The Iconclass search function for illustrations or if you prefer a simple keyword search, and even for some images a similarity search, place this collection ahead of all others. The illustration search and the overviews of subjects helps you to rethink your own approach and questions. By the way, the Bodleian Libraries recently developed a digital manuscripts toolkit for working with digital images along the lines of the International Image Interoperability Initiative Framework (IIIF). American culture and history come into view at the Isaiah Thomas Broadside Ballads Project of the American Antiquarian Society (AAS). Isaiah Thomas collected broadsides in Boston during the early nineteenth century. Here you can find some 300 broadsides, and also thirty recordings of ballads. You can search directly or browse subjects in alphabetical order, which usefully includes also the woodcuts. It is a treat to look at the overview of digital projects supported by the AAS. Here it must suffice to mention the American Vernacular Music Manuscripts, ca. 1730-1910 hosted at Middle Tennessee State University. The notable collection collected by Helen Hartness Flanders is now at Middlebury College, Middlebury, VT; you can consult some 450 digitized broadsides ballads of this collection in the Internet Archive. Pop music and poetry are the heart of the digital collection Beat Movement: Poetry and Broadsides (Utah State University). I did not conduct an exhaustive search for American examples. You will find them also using the Digital Public Library of America. A quick search in the rich digital collections of the New York Public Library brought me just one result, which cannot be the complete truth. Patient research will surely yield much more. For this the Smithsonian Center for Folklife and Cultural Heritage and the Smithsonian Folkway Recordings are an appropriate starting point. If you have doubts about the value and use of these digital collections you can find much in the current issue of the journal Recherche en sciences sociales sur Internet (RESET) on Patrimoine et patrimonialisation numérique / Heritage and Heritagization (6/2017). The acronym RESET is in this case strong! The digital turn is much more than only quick access to resources faraway, a theme articulated for global history in the 2016 article by Lara Putnam discussed here last year. At the Revues portal you will find also the Swiss journal Cahiers d’ethnomusicologie. With the MMSH at Aix-en-Provence and the Smithsonian and other institutions I came from ballads in print to modern recordings of old ballads, and it is tempting to follow that road already here in more detail. I will return to the use of recordings in another post in the future. In this post you will find hopefully enough for your own interests. On the other hand you might want to look at more treasures at the Musée d’histoire des crimes, de la justice et des peines created by the Criminocorpus team or start following the Criminocorpus blog. This entry was posted in Libraries and tagged Ballads, Broadsides, Criminal law, Cultural heritage, Digital humanities, Early Modern history, Europe, Law and Humanities, Legal history, Music, Pamphlets, United States of America on October 26, 2017 by rechtsgeschiedenis.